President Trump has signaled that resolving the Palestinian-Israeli conflict is a high priority for him. How might he go about this task? This blog attempts to flesh out the contents of his Palestinian-Israeli plan. This plan "is based on the 2002 Arab Peace Initiative," which Siryoti summarizes as Arab states agreeing "to normalize relations with Israel if the Jewish state met certain conditions, chiefly among them withdrawing to the 1967 lines, resolving the refugee issue and establishing an independent Palestinian state." Note that Israel must go first, followed by the Arab states. "Trump told Abbas that this new effort should not be interpreted as a disavowal of the two-state solution, but only that the president wanted to think outside the box and explore other options." It will start with "some form of normalization between moderate Sunni-Arab states and Israel," though that normalization "will be largely symbolic," consisting of recognition of Israel and its right to exist, but not peace treaties, the exchange of embassies, or (presumably) trade and citizen exchanges. "Direct negotiations between the Israelis and the Palestinians [will have] a set timetable aimed at finding a compromise on core issues such as borders, the status of Jerusalem, the fate of Judea and Samaria communities outside the major settlement blocs, and the right of return of Palestinian refugees." Then comes an interim Palestinian-Israeli deal followed by a final status agreement, "culminating with the creation of an independent Palestinian state and a joint Israeli-Palestinian statement declaring an end to the conflict." The aide describes Abbas as "vehemently opposed" to this approach. intends to exact an unspecified price from Israel for the recognition, stating "Israel will pay for that" and it "would have had to pay more." Q: What was the highlight of your first year, what was the highest point? A: I think Jerusalem was a very big point. And I think it was a very important point. The capital, having Jerusalem be your great capital was a very important thing to a lot of people. I have been thanked and, in some cases, not thanked, to be 100% honest about it. But it was a very important pledge that I made, and I fulfilled my pledge. Q: I think the entire nation of Israel says one big thank you, sir. Was the decision on Jerusalem one of your goals for your first year in office? A: That's right. I said that I would like to be able to do it in the first year. I can understand why many other presidents bailed on their promise, because tremendous pressure was put on them not to do it. The other presidents, all of them have failed in the promise even though they made it as a campaign promise, but I understand it because I will tell you, the lobbying against it was tremendous. Q: What did you mean when you said recently in Davos that Jerusalem was off the table because of your decision? A: By taking Jerusalem off the table I wanted to make it clear that Jerusalem is the capital of Israel and as for specific boundaries, I would support what both sides agreed to. Q: Will Israel have to give something in return for the decision on Jerusalem? A: I think both sides will have to make hard compromises to reach a peace agreement. Q: Obviously there is suspense in Israel about the imminent peace plan. When will the U.S. unveil its peace plan? A: We are going to see what goes on. Right now, I would say the Palestinians are not looking to make peace, they are not looking to make peace. And I am not necessarily sure that Israel is looking to make peace. So, we are just going to have to see what happens. Q: Will settlements be part of the plan? Q: I'm guessing that Egypt and Cairo are supposed to play a key role in the peace plan. Are they willing to play that role? Q: What are your thoughts about U.S.-Israel relations right now? A: I think they are great. I think Bibi [the popular nickname for Israeli Prime Minister Benjamin] Netanyahu is a terrific person, a terrific leader, I think the relationships are good, but I think they will be a lot better if they ever get to making a peace deal. In summary, Trump reiterated prior warning about "hard compromises" ahead for Israel, giving warnings about Israeli towns on the West Bank, and saying that relations with Israel will improve after reaching an agreement with the Palestinians. Perhaps most significantly, he expressed doubts about Israelis even wanting peace. Comments: Taken as a whole, these comments confirm my prediction that U.S.-Israel relations could go seriously awry with Trump as president. Feb. 21, 2018 update: Khaled Abu Toameh notes that Abbas, in his speech to the U.N. Security Council, toned down his hostility toward both the U.S. and Israeli governments. Abu Toameh interprets this as a wish to stay relevant; I interpret it as a small step toward fixing relations with the Trump administration. Place the Old City of Jerusalem under "international protection." Palestinians give up their demand for a "right of return." Large Jewish towns on the West Bank to remain in place, small settlements to be "relocated." Expand the PA's security and administrative authorities in areas A and B of the West Bank. $40 billion to be given to the Palestinian Authority to help establish a Palestinian state and its government institutions. An international conference to be held in one of the Arab capitals, most likely Cairo, with Israelis in attendance. The Trump administration would "invent" a capital for a Palestinian state in the suburbs of Jerusalem (outside the current municipal boundaries of the city). The Trump administration would announce within a period of two-three months its recognition of the annexation of settlement blocs. Trump, according to the report, is proposing the annexation of 10 percent of the West Bank, while Prime Minister Binjamin Netanyahu wants to annex 15%. The Trump administration would then announce a joint security concept for Israel and the Palestinian state as peace partners. The concept would include the establishment of a demilitarized Palestinian state with a strong police force; bilateral, regional and international security collaboration with the participation of Jordan, Egypt and the US, while leaving the door open for other countries to join in; the presence of Israeli forces along the Jordan River and "central hills" in the West Bank to protect the two states; and giving Israel overriding security responsibility for emergency cases. The world would recognize Israel as the homeland of the Jewish people. The world would recognize the Palestinian state as the homeland of the Palestinian people. Israel would guarantee freedom of worship to all religious sites by maintaining the status quo. Parts of the Ashdod and Haifa ports and Ben Gurion Airport would be allocated for Palestinian use, while security responsibility would remain in the hands of Israel. Palestinians would have presence at international border crossings, while overriding security responsibility will remain in Israel's hands. Territorial waters, airspace and electromagnetic waves will remain under Israeli control, without prejudicing the needs of the Palestinian state. A safe passageway would be opened between the West Bank and Gaza Strip under Israeli sovereignty. A just solution would be found for the issue of the refugees in the context of the future Palestinian state. The Americans, according to the report, have notified some Arab capitals that Trump's decision to move the US embassy from Tel Aviv to Jerusalem was "part of an American effort to persuade Israel, especially the hardliners, to agree to possible concessions to the Palestinians." Mar. 25, 2018 update: Writing in Al-Monitor, Uri Savir has another Trump plan leak to offer, from "a senior US diplomat in Tel Aviv". He characterizes it as a "two-state solution ... that Netanyahu could accept" and "much closer to Israel's positions than to the Palestinian positions." Palestinian East Jerusalem neighborhoods will be part of the Palestinian state, but not the Old City, except for religious jurisdiction on the mosques together with Jordan. It would be proposed that the Palestinians adopt East Jerusalem neighborhood Abu Dis as their capital. The Palestinian state will have limited sovereignty on limited territory (about half of the West Bank and all of the Gaza Strip), with Israel responsible for security for much of the West Bank and the border passages. The Jordan Valley will be under Israeli jurisdiction with an Israeli military presence. Gaza will be part of the Palestinian state provided that Hamas is disarmed. There will be no right of return to sovereign Israel for Palestinian refugees. A compensation mechanism for refugees will be established by the international community. The US plan demands that Israel be recognized as the homeland of the Jewish people and Palestine, with limited sovereignty, as the homeland for Palestinians. The White House plans to offer the Palestinians a very significant economic assistance package. This package would engage the United States, the European Union and Saudi Arabia. Regional anti-terror cooperation as well as regional normalization with Israel will take place, according to the 2002 Arab Peace Initiative. On the basis of this plan, the parties will negotiate a detailed agreement, to be reached by 2021. Comment: Unstated here but implicit to Jerusalem becoming its capital is that the U.S. government will recognize "Palestine." 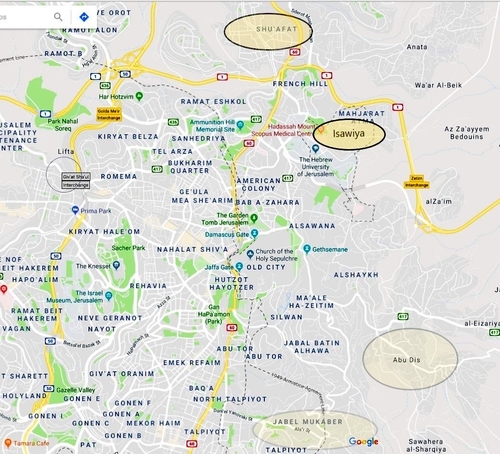 The four neighborhoods – Shuafat, Isawiya, Abu Dis, and Jebel Mukaber - reportedly to be transferred to the PA under the Trump plan. May 5, 2018 update: Without going into details, Liberman himself has confirmed the general point I am making here, that the Palestinians have a major gift awaiting them. In his words, "There is no free lunch," "There will be a price for the national ambition and the realization of a vision. There will be a price for the opening of the US Embassy in Jerusalem and it is worth paying it" because the embassy relocation "is important, historic and dramatic." May 15, 2018 update: I published a follow-on analysis on this topic today at National Review Online: "Enjoy the Jerusalem Embassy – But Don't Get Giddy." May 27, 2018 update: I replied to Jonathan Tobin's sanguine analysis of this topic at "Israel Has Nothing to Fear from Trump's Plan?" June 18, 2018 update: Adam Entous' article "Donald Trump's New World Order," contains two pieces of information that boost the idea of Trump making major demands of the Israelis. asked Trump how he would approach negotiations between the Israelis and the Palestinians. Trump cast himself as a neutral party, interested in getting the Israelis and the Palestinians what they needed to end the conflict. "People are going to have to make sacrifices, one way or the other," he said. Trump told Abbas that he was keeping his campaign promise to move the Embassy. Trump then launched into an impromptu monologue. One former aide described it as "heartfelt." Trump told Abbas that he was committed to getting the Palestinians the best possible deal and that Israel would make real concessions that he would be happy with if he stayed engaged. He added that Abbas would get a "better" deal under his Administration than under Obama's, a line he repeated more than once. 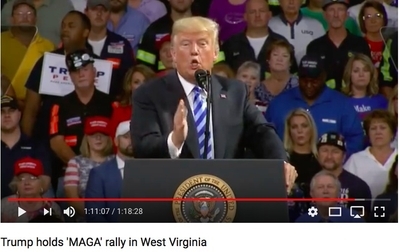 Aug. 22, 2018 update: At a rally in West Virginia, Trump spoke over and over again about his having "taken Jerusalem off the table," then (at 1:11: into his talk) turned to what comes next. First, about the Israelis: "In the negotiation, Israel will have to pay a higher price because they won a very big thing." Next about the Palestinians: "They'll get something very good, because it's their turn next." The Palestinian Authority immediately responded by laying its terms. Majdi al-Khaldi, an adviser to Mahmoud Abbas said that "The American administration made a major mistake when it recognized Jerusalem as Israel's capital and moved its embassy there. There is no compensation the administration could offer for those moves other than recognizing the State of Palestine with East Jerusalem as its capital and clearly defining the two-state solution as the sole solution." Comment: Since December, Trump's allusions to rewarding the Palestinians have been mostly ignored; this one, however, did get some attention. Trump warns the Israelis that they will "pay a higher price" in negotiations with the Palestinians. The president feels that if the parties are lucky enough to be sitting in a room and making progress, he might say to the Israelis, "Look, can you do a little bit more? Look what we did for you. Is there's something more that you could do?" It's not that he has something specific in mind, but just that under the circumstances, that the United States has engaged in really significant good-faith efforts to strengthen Israel and strengthen its historical multi-thousand-year connection to Jerusalem, maybe the Israelis could make it clear by leaning in a little bit as well. That's all it meant. ... There is not and there never was any demand made of Israel that they do anything in exchange for the embassy move. Comment: I hope he's right, but I am not at all convinced. Sep. 2, 2018 update: Moving the diplomacy in a very different direction, Mahmoud Abbas reported about his talks with the Americans: "I was asked if I believe in a [Palestinian] federation with Jordan." He then quoted himself replying, " Yes, I want a confederation with Jordan and Israel. I have asked the Israelis if they would agree to such an offer." Sep. 13, 2018 update: Special Representative for International Negotiations Jason Greenblatt stated: "We're going to have to defend the plan to Israelis and Palestinians. We are ready for criticism from all sides, but we believe this is the best path forward for everyone." PRESIDENT TRUMP: Actually, by taking off the table the embassy moving to Jerusalem, that was always the primary ingredient as to why deals couldn't get done. I spoke to many of the negotiating teams, and they said they could never get past the embassy moving into Jerusalem and all of what that meant, which you know what that meant. That meant everything. And now, that's off the table. PRESIDENT TRUMP: Well, that's a big chip that they got. I took probably the biggest chip off the table, and so obviously we have to start — you know, we have to make a fair deal. We have to do something. Deals have to be good for both parties. Otherwise, you don't have a deal and you don't have a lasting deal. I want to have — I want to have a plan, Steve, that is solid, understood by both sides — really, semi-agreed to by both sides before we start a negotiation. ... It is a very complex situation, but I think we have some brilliant ideas. Ideas that have never been thought of before. Ideas that are good for both parties. And again, it has to be good for both parties. Okay? Comment: In the past, Trump spoke of Israel paying a "price" for the embassy move to Jerusalem; now, he's talking about it having "to do something." I see this as a significant change in wording: Before, it was the U.S. government that on its own was to recognize Palestine with Jerusalem as its capital. Now, Trump seems to be demanding that Israel do so as well. If this is correct, it's an even worse imposition on the Israelis. apparently much closer to the one promoted by Abbas than to Netanyahu's adamant embrace of the status quo. ... Two sides of the American-Israeli-Palestinian triangle are seeking a change in the status quo, while one (Netanyahu) strenuously objects. ... If the administration succeeds in bringing the Palestinians on board, Netanyahu will be the one who finds himself thrust into a corner by the two other sides of the triangle. It will include a resolution to all of the core issues, including the refugee issue, and will also focus on Israel's security concerns." [The proposal will] "be heavily focused on Israeli security needs. But we also want to be fair to the Palestinians. We have tried hard to find a good balance. Each side will find things in this plan that they don't like. There are no perfect solutions. There needs to be a dialogue. No progress will be made if we don't talk to each other. But we will release the peace plan even if the Palestinian leadership does not talk to us. We think the Palestinian people deserve to see it and decide if it is the right path forward. They certainly should not be prevented from seeing it and considering it. The reality is that we are trying to help them achieve a free society. A leadership that blocks this effort is the opposite of what it means to have a free society. We'll release the plan when the time is right. very detailed ... Previous peace proposals were brief and vague, and no one really understood what exactly was meant by some of the terms used. We will present something that will give both the Israeli and the Palestinian people a concrete idea of what a peace deal could look like. It'll be very specific so that they can tell their leaders what they think about it. In the end, we want people to think about whether our plan can make their lives better and is worth the compromises. Oct. 10, 2018 update: I tweeted this today. According to a statement issued by Fatah in Ramallah, the (unseen) "deal of the century" requires Palestinians to "give up Jerusalem and the right of return and the right for compensation for Palestinian refugees." Trump's plan, according to Fatah's imagination, also envisages separating the West Bank from the Gaza Strip "to prevent the establishment of an independent and sovereign state, on the pre-1967 armistice lines, with Jerusalem as its capital." I've given a lot to Netanyahu. I moved the embassy to Jerusalem ... We give Israel $5 billion a year. I can be tough with Netanyahu on the peace plan, just like I've been tough on the Palestinians. (The $5 billion figure appears to be an overstatement of the $3.8 billion annual allotment of military aid.) When Macron said Netanyahu prefers the status quo to a peace deal, Trump further distanced himself from Netanyahu, allegedly replying, "I'm very close to reaching that same conclusion." Trump explained his recent series of tough steps against the Palestinian Authority that won him much praise in Israel: "I was tough on the Palestinians because they wouldn't talk to us, and that's unacceptable." In other words, he did not strategically reject their cause against Israel but tactically pressured them to return to the negotiating table. Comment: It surprises me that almost no one agrees with my conclusion that a massive gift is coming to the Palestinians. How many signals does Trump have to send out to prepare the way before someone else notices? 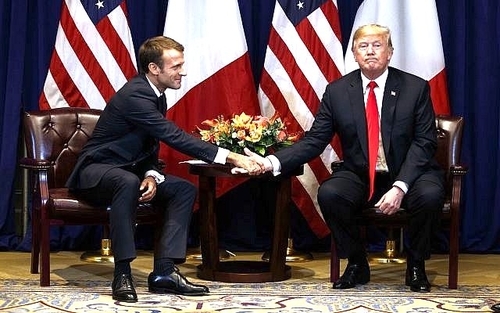 Macron (L) and Trump met in New York on Sep. 24, 2018. Oct. 16, 2018 update: Ynet News quotes unnamed American officials saying that "the peace plan will not require Israeli security concessions, but Prime Minister Benjamin Netanyahu will have to demonstrate leadership and make difficult decisions." As long as we're in the Israeli government, we won't agree to a divided Jerusalem, or to a shared capital. It took us years to extricate ourselves from the hole created by Barak and Olmert with their hallucinatory suggestions, granting to the Palestinians the Temple Mount. As long as we're in Jerusalem, we won't permit any concession of Israeli sovereignty. ... There won't be a joint capital in Jerusalem even in 1,000 years. Oct. 25, 2018 update: Israelis at large may be oblivious to the looming tensions but, according to Amnon Lord writing in Israel HaYom, "sources close to Netanyahu expect a moment of intense debate with the Trump administration, if not a political confrontation." Oct. 23, 2018 update: Saudi Foreign Minister Adel al-Jubeir has stated that "The key to normalizing [Saudi] relations with Israel will have to be the [Palestinian] peace process." The meaning of this is simple: "President Trump, if you want to build a successful anti-Tehran coalition, you first have to please the Palestinian Authority. When it's content, we can proceed." Comment: The only problem is that the PA will not be content until the Jewish state is extinguished. So, this is both an oxymoron and a recipe for troubles U.S.-Israel relations. Nov. 10, 2018 update: Israel's Channel 10 quotes Jason Greenblatt saying that neither side will like what's in Trump's plan and both will need to compromise. Nov. 21, 2018 update: Israel's minister of justice, Ayelet Shaked: "I think that the gap between the Israelis and Palestinians is much too big to be bridged. Personally, I think [the Trump peace plan] is a waste of time. I want peace like anyone else, but right now it's a waste of time." Comment: I concur but am not sure it's wise for an Israeli minister to say such a thing. both sides would benefit greatly from a peace agreement, but the Palestinians would benefit more, and the Israelis would risk more. ... There are things in the plan that every party will like and there are things in the plan that every party will not like. That is certainly true for the Israelis and the Palestinians. Many of the groups that have been supporters of Trump's Israel and Iran policies — StandWithUs, the Israeli-American Council, the Republican Jewish Coalition — have not commented publicly since the president announced he was removing America's military presence from Syria. When the "deal" comes, they will have to jump in, however reluctantly. includes a clear partition of Jerusalem into three sections, and "it is not about a Palestinian capital in Abu-Dis (a Palestinian village in the Jerusalem governance area) but in significant sections of East Jerusalem." According to the source, there will be two capitals in Jerusalem: the Israeli capital in West Jerusalem including control over the Western Wall and Jewish neighborhoods in the city's eastern sections, and the capital of Palestine in the eastern section. In addition will be a third region, within the Holy Basin, to be under international control. I look at the implications of such a plan at "If Trump Wants to Divide Jerusalem in Three." In brief, it's a disaster: "if Caspit is correct about Trump proposing to divide Jerusalem into three, the consequences will be major and long lasting." Jan. 2, 2019 update: Citing Palestinian officials, Al-Hayat reports that Avigdor Liberman told details of Trump's plan to Palestinians before he resigned as Israel's defense minister in November. Liberman's office denies the report: Liberman "has never seen the plan, and to the best of his knowledge the Americans haven't revealed the details of the plan to any Israeli, and it isn't a sure thing that it has been completed. The report is simply incorrect." With that caution in mind, what does Al-Hayat say? The establishment of a sovereign Palestinian state headquartered in Gaza, with Arab residents of the West Bank citizens of this state. Economic incentives for the Palestinians, including large donations to build infrastructure in Gaza, including an airport and a sea port. Israel maintains control of West Bank borders and crossings, as well as over security and water. Israel keeps the Jordan Valley. Israel controls "a large part" of eastern Jerusalem (whatever that means). Israeli communities in the West Bank remain; but it's not clear if this means some or all of them. Strikingly, there is no mention of Jerusalem as the capital of this "Palestine." Nor mention, as in the prior leak, of some of Jerusalem coming under international control. What parts of eastern Jerusalem fall under Palestinian control is, of course, massively important: Abu Dis or the Temple Mount? Giving Palestinians control over parts of Areas B and C would be a major development. Economic incentives for the Palestinians implies buying into the old and failed notion that richer Palestinians would be more peaceable ones. Apparently, the U.S. government has still not left Shimon Peres' "New Middle East" fallacy behind. "includes the establishment of a Palestinian state in about 90 percent of Judea and Samaria, with at least part of eastern Jerusalem as its capital." demands "that isolated settlements outside the blocs not be expanded and outposts considered illegal by Israeli law be evacuated." gives the Palestinian state "more than twice the total area of Areas ​​A and B under the control of the Palestinian Authority today." divides "Jerusalem from a sovereign perspective into two capitals - Israel's in the west of the city and parts of eastern Jerusalem, and the Palestinian one in the Arab neighborhoods of eastern Jerusalem." leaves "the Temple Mount, the Western Wall and the Mount of Olives ... under Israeli sovereignty, but with full administrative partnership with the Palestinians." 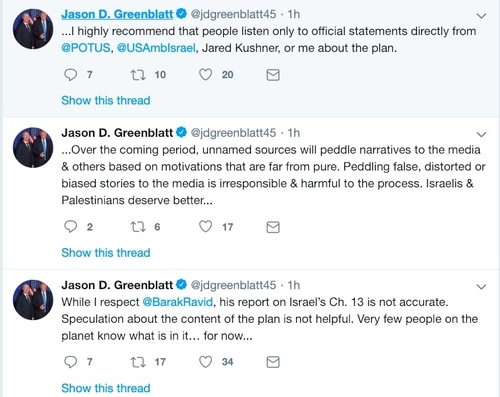 In response, Jason Greenblatt, Trump's special representative for international negotiations, called this report "not accurate" and "highly recommend[s] that people listen only to official statements directly from @POTUS, @USAmbIsrael, Jared Kushner, or me about the plan." Jan. 17, 2019 update: The Palestinian Authority responded to this new leak said saying that "any peace plan that does not include an independent Palestinian state - with all of East Jerusalem as its capital - on the 1967 borders, is destined to fail." The key words are "all of East Jerusalem," (meaning what was Jordanian Jerusalem until 1967), as the leak has only "part of eastern Jerusalem" as the capital. Comment: But of course it will say no to the first offer on the table. Why accept 90 percent of your goals when you can demand 100 percent? Of course, the PA will delightedly accept the 90 percent if that's all it can get. Jan. 24, 2019 update: I published "Trump's Mideast 'Deal of the Century' May Be a Raw One for Israel" in the Wall Street Journal today, bringing together quotes from this blog in one place and concluding that "Americans who support Israel and Republicans hoping for the president's re-election both need to protest and obstruct the prospect of this misbegotten 'deal of the century'." will include U.S. recognition of Palestine with contingencies, according to the source, who was not provided the specifics behind the conditions. The capital of the Palestinian state will consist of remote parts of eastern Jerusalem, said the source. ... Additionally, the peace plan includes official U.S. recognition of large Israeli towns in Judea and Samaria, according to the source, who did not know which ones. Feb. 12, 2019 update: Israel's Justice Minister Ayelet Shaked says, based on her sources in the Trump administration, that the plan demands that Israel "turn over large swaths of land in Judea and Samaria to the Palestinian Authority, and will lead to the establishment of Palestinian State." Shaked added a political note: "In April when the Trump plan is introduced, it will call for a P.A. state. So who will be in the government, us or [Benny] Gantz?" A senior Trump administration official responded: "with all due respect for the Justice Minister, she has not seen the plan." Netanyahu does indeed form a coalition similar to the one he had over the past four years, there is absolutely zero chance of him making even the slightest concession for peace, since he won't have support for such concessions within his own government. In contrast, Tibon argues, "A new, centrist-oriented coalition would give the Trump administration an opportunity to put forward a plan that would not be rejected by Israel." The Trump plan is likely to prove Benjamin Netanyahu's great moral and political test: will he stand up to it or not? The Netanyahu of 20 years ago would not have; I am more optimistic about today's version. Contrary to Tibon, I expect public opinion in Israel to be dismayed by U.S. recognition of Palestine, so it will not make much difference what sort of coalition Netanyahu heads. was a great initiative, in 2002 when it was done, but it hasn't produced peace, so if that was the framework under which something would be accomplished then I think that would have been accomplished a long time ago, and then I wouldn't be doing the duty I'm doing right now to try to bring the people together. Feb. 24, 2019 update: It's election season in Israel and Naftali Bennett warns that "Netanyahu and President Trump have agreed to come out with the plan to establish a Palestinian state on 90 percent [of the West Bank]." analysts who have followed its development said that they had been told it would involve investing around $25 billion in the West Bank and Gaza over 10 years and another $40 billion in Egypt, Jordan and perhaps Lebanon, depending on their performance meeting certain goals. Others who have spoken with Mr. Kushner disputed those specific figures but agreed that it would involve tens of billions of dollars to those parts of the region. The bulk of the money would come from the region's wealthiest states, and while the United States would contribute as well, it was not clear how much. The political plan, which is very detailed, is really about establishing borders and resolving final status issues. The goal of resolving these borders is really to eliminate the borders. If you can eliminate borders and have peace and less fear of terror, you could have freer flow of goods, freer flow of people and that would create a lot more opportunities. We were not able to convince people from both sides on a compromise. Therefore, we did not focus a lot on the issues, despite our deep knowledge of them. We focused instead on what prevents the Palestinian people from using their full potential, and what prevents the Israeli people from integrating properly in the entire region. ... The American peace plan is very detailed and will focus on drawing the border and resolving the core issues. Finally, Kushner noted that his team "tried to find realistic and fair solutions ... to allow people to have better lives" and that the plan will focus on four ways to achieve that goal. The prevailing opinion within Israel's highest political-security ranks is that Netanyahu is completely in the US administration's loop regarding the "deal of the century," and that Washington and Jerusalem were supposed to present it after the elections. "The "deal of the century," explains a high-level Israeli Cabinet member speaking with Al-Monitor on condition of anonymity, "is meant to try to extricate Netanyahu from his legal troubles. After the elections, he is supposed to take a political turn to the center and announce to the public that there is no way he can turn down the best US president that Israel ever faced in the White House." The minister added, "On this basis, he will establish a coalition based only on parties willing to say 'yes' to Trump, on the assumption that the Palestinians would do the work for us by again rejecting any possibility of reaching an arrangement with Israel." New Right chair Naftali Bennett spoke at length about the plan. According to the Times of Israel, He accused Trump of "planning a Palestinian state right over our heads," and demanded the release of his plan before Israel's April 9 elections. "It seems that everybody is in the loop, planning the Palestinian state right over our heads: the Americans, the Saudi prince, the Palestinians, the Jordanian king — even Erdoğan of Turkey, blatant anti-Semite! Even he's in the loop!" Bennett charged. "Everybody's in the picture. Everybody but us, the people of Israel." In a wry parody of Moses's biblical demand that Pharaoh release the Israelites from slavery, Bennett declared: "President Trump, let my people know." a referendum on the creation of a Palestinian terror state, which will threaten our very existence. This is not theory. This is about the lives of our children. Let my people know what will happen to Jerusalem. It's our land. It's our lives. It's our future. And it's our right to decide our fate. The Land of Israel has been our homeland for almost 4,000 years. Nobody can tear it apart. Nobody can divide Jerusalem again. will not include establishing a Palestinian state, and instead will propose Palestinian autonomy in the Gaza Strip with political and economic links to the West Bank. ... In addition, the Palestinians will hold negotiations with Israel over Area C of the West Bank, which is under Israeli military control. The deal will also include strengthening cooperation between Israel, Jordan and the Palestinians over the management of the Al Aqsa mosque. some $25 billion will be invested in the Gaza Strip and the West Bank; in addition, the US will transfer an additional $40 billion to Egypt, Jordan and possibly Lebanon "to ensure their cooperation" in implementing the deal.